What’s the Matter, and invite you to celebrate this opening of our second season. What’s the Matter is a group exhibition featuring recent works by Michelle Benoit, Daniel Bruttig, Laura Kaufman and Richard Roth. The artists brought together in this show curated by Mark Van Wagner all share an interest in using unconventional materials and ways of formatting. 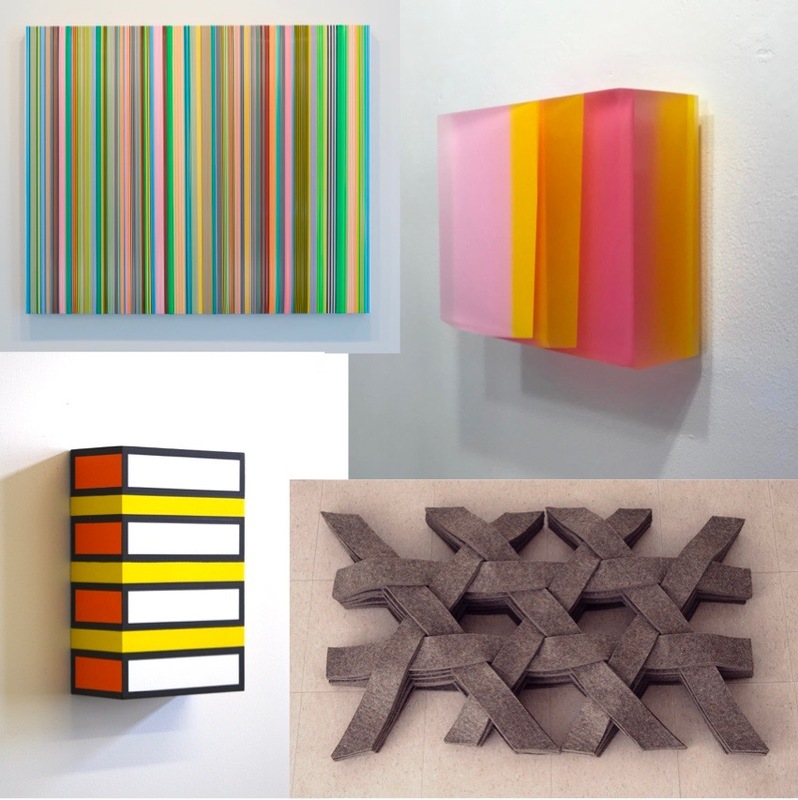 Their works are process based, yet reveal formal abstraction, and often oscillate between different media such as sculpture and painting, denying any clear categorization. Michelle Benoit has created a current body of work, aptly called “Painting Objects,” which also resists being categorized into a specific medium. Her compositions apply a sculptural process to create painting-like objects. Mostly recycled and reclaimed materials — such as wood, lucite, paints, and mixed media — are cut, assembled, stacked, adhered, and re-cut, and added on top of a flat surface. Coalescing into layers of transparency, this work unveils the process and depth, and starts an interaction with surrounding light. Daniel Bruttig deliberately uses a wide range of styles and mediums, dispelling the notion of a singular artistic mode of production. His work includes drawings as well as objects which he creates by pouring, smothering, submerging, wrapping, connecting, stacking, and layering materials such as polymer, thermoplastic adhesive, resin, wax, found objects, wood, and fabrics. His so-called “Bound Paintings” are made by using a plenitude of colorful lanyards which transform them into abstract painting. Laura Kaufman bases her work on notions of language and geometric abstraction, building as well as undermining an existing system of shapes, words, and numbers. In her drawings and sculptural work, she uses materials such as industrial felt, steel, linen, and cotton, and applies traditional artisanal techniques such as joining, embroidering, weaving, and folding to create works that are often highly tactile, looking both familiar and strange at the same time. Richard Roth makes works that could be described as 3-D paintings. His process starts with small box-like objects made of plywood, which resemble a minimal sculpture, but whose planes the artist uses as a surface for his paintings. The geometric patterns and colorful blocks of these abstract, geometric, nearly-minimal compositions leave a sleight-of-hand visible, reminiscent of sources such as Navajo blankets, mollusk shells, or licorice candies. We look forward to an engaging visit with you at the Gallery!